From the terror of filthy, rotting death to the haunting beauty of living and growing forms. "Fred Grabosky is a Philadelphia based designer and fine artist working under the FTG Illustrations moniker. Highly skilled in pointillism, crisp line work techniques, and scratch boarding; Grabosky wields his pen and scraper with the utmost conviction. His restrained color palette and fine attention to detail conjures a world where the macabre and the elegant are held in equal balance. Grabosky’s work encompasses themes of nature, ritual, anatomy, geometry, folklore, and the occult. His thematic diversity demands a wide range of mediums and as such, he has honed his talents as a designer, screen printer, scratchboard artist, and pen and ink illustrator. Grabosky has created album art, gig posters, and merchandise for the likes of Tombs, Yob and Heavy Temple; as well as the Shadow Woods Metal Fest. 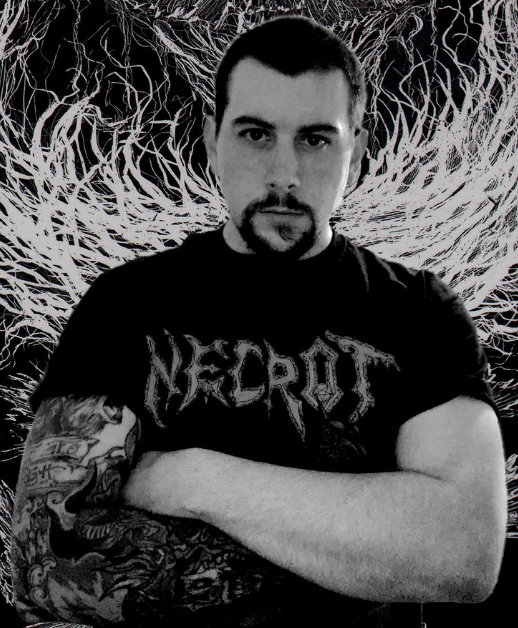 A musician himself, Grabosky currently performs with the metal group God Root. With a diverse style ranging from the minimalist to the sumptuous, Fred Grabosky is a true and unique master of many mediums."